our books first edition is sold out and we are currently working on a second edition to be published in 2017/2018. Your comments and suggestions are welcome. Please feel free to contact us. The Wonderland manual for emerging architects is not about architecture but about architects, not about the work that architects produce but about how they produce it. It is first and foremost a guide containing facts and figures, tips and experiences and as such can be seen as a handbook for European architects about how to conceive, establish, develop and run an architectural practice nowadays. How can emerging architects manage their start-up? Where should they set up the business, which are the diverse factors they need to consider, how does the team achieve the desired public awareness and how can it prevent mistakes? In the recently published Manual for Emerging Architects, Wonderland, the platform for European architecture, answers these and many more questions. The manual comprises experts’ contributions, teams’ firsthand accounts as well as surveys on how to conceive, establish, develop and run an architectural practice nowadays. Wonderland is a network for European architectural offices. Since 2002 the think-tank explores the professional, economic, and social aspects of the profession. Wonderland fosters inter-European exchange by the means of international collaborations and symposia, conducting research on current issues related to architecture or urban planning and sharing the results at exhibitions and in publications. Based on the experiences of offices throughout Europe, the newest publication casts light on the every-day challenges that one is in for as an emerging architect. At the beginning of the step by step guide, the authors deal with issues related to the decision of where to set up office and how to go about it while considering national differences. The next section focuses on mistake prevention, crisis management and how failure can be a source for new ideas. The significant topic of public awareness, self-marketing and how to create an image while staying authentic is also covered. In addition, why and how to get specialized as an architect and the matter of participating in competitions is discussed. The book comprises contributions by Tore Dobberstein, Hans Ibelings, Michael Obrist, Kari Juhani Jormakka, Tatjana Schneider and many more as well as interviews with Tomas Sieverts or Dickon Robinson. 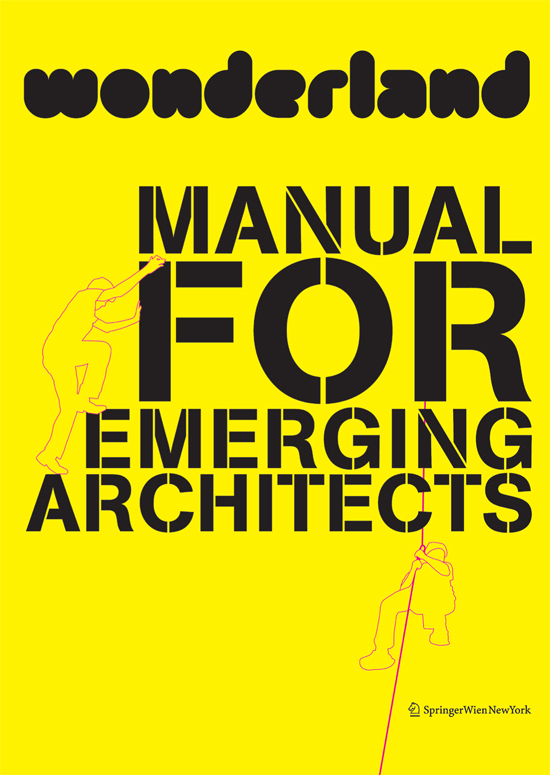 Wonderland’s Manual for Emerging Architects is an indispensable handbook for architects at the start of their careers and supports them in finding their own way into the realm of planning and building by making informed career decisions. ufbwrciqcf,Waw! Its really great and wonderful ever i found. Thank you for sharing this info.